These solid black oak upstands are constructed from the same 40mm oak staves that are used to make our black oak worktops, which provides an elegant alternative to having tiles all the way down to the worktop's surface. 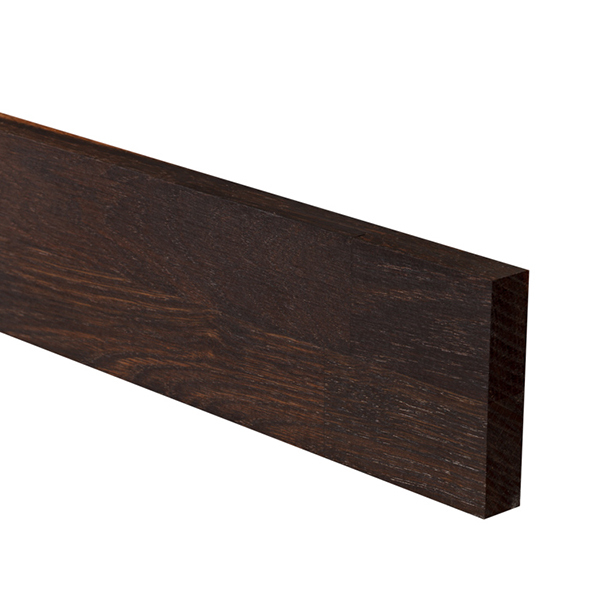 Black oak upstands also serve to hide the small 5mm expansion gap that is required when installing a worktop against an adjoining walls, and are also suggested for accompanying worktops against uneven walls. They prevent the need for the worktops to be cut-to-size by covering any small gaps that would otherwise be visible. Unlike other kitchen worktop upstands, our black oak upstands are supplied with a square-edged that needs no additional cutting if you are trying to achieve a chunky aesthetic. Alternatively they can be customised with an edge profile along the top to fit in with the overall theme of your kitchen. Read more about the importance of high-quality upstands by reading our dedicated information guide.